Vodafone has announced that the new Blackberry Storm will only be available on their network initially in a number of different countries including the UK and Netherlands. 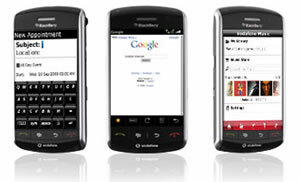 The Storm, previously codenamed the Thunder, is aimed at a different type of user from the previous Blackberry models. It’s doesn’t have a signature-Blackberry QWERTY keyboard, but a touch screen instead. It’s clearly gunning for the iPhone market. The touch screen is a little strange as back in May this year, Mike Lazaridis, president and co-CEO of RIM, makers of the Blackberry, was giving forth on how QWERTY keyboards ruled the roost for input and touch screen wasn’t a patch on QWERTY. We have to agree with him, no touch screen phone ‘keyboard’ that we’ve used is anything think like as good as a physical keyboard. If you want to enter text, a real keyboard wins hands down. You just can’t get the speed of input. We’ll be watching the Storm with interest to see if it’s able to attract consumers as well a business types.